The Great Hall of The Metropolitan Museum of Art filled quickly on April 18 as members of the Haskins Giving Society arrived for the 38th Annual Haskins Giving Society Award Dinner. The society, named for founding Dean of NYU Stern, Charles Waldo Haskins, is a growing network of over 1,000 business leaders with a shared dedication to the School. One of the longest standing Stern traditions, the dinner honors its most generous and loyal donors each year and celebrates its namesake’s legacy of commitment to business and public service. 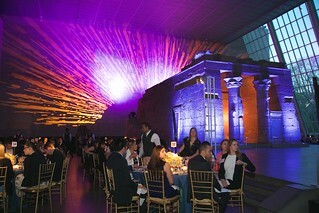 Guests were guided through the Egyptian Art hall to The Temple of Dendur in The Sackler Wing, aglow with beautiful decor for the evening’s festivities. Board of Overseers Chair, Alison Mass, BS '80, MBA '81, and Dean Peter Henry were pleased to welcome the distinguished Haskins members in attendance, expressing sincere gratitude on behalf of NYU Stern for their commitment and support for the School. This year’s Charles Waldo Haskins Award was presented to Philip L. Milstein, MBA ‘74, Board of Overseers member and Principal of Ogden CAP Properties, LLC for his remarkable career in real estate and his longtime, wide-ranging support for NYU Stern. In addition to supporting Stern scholarships, professorships, the Stern Fund, and the Center for Real Estate Finance Research, Philip and his wife, Cheryl, recently established the Philip and Cheryl Milstein Opportunity Scholarship to provide full-need financial assistance to two high-achieving, low-income undergraduate students. Mr. Milstein was honored to receive the award and to share the experience with his family who proudly attended the event. He traced the Milstein legacy back to his father, Seymour Milstein, who earned his BS in Economics and co-captained the Varsity Debate Team at NYU in the 1940s. “My father was my mentor in philanthropy, teacher in business, and the best man in my wedding,” said Mr. Milstein. He and his sister, Constance Milstein, continue to carry out their father’s legacy in all areas of their lives. A three-generation NYU family, the Milsteins are proud to see the School’s positive changes over the years. Mr. Milstein praised Dean Henry for the many programs pioneered under his leadership, as well as his record-breaking fundraising accomplishments.